It would be nice to have a universal watch that has all the outdoors capabilities (such as compass and altimeter) but is also elegant enough to be worn as a regular everyday watch. A watch you can take everywhere, both diving and skiing, as well as to a business meeting. I wrote a first version of this article in 2007, and now, seven years later, I am still looking for the perfect indoors/outdoors watch. Some watches come tantalizingly close, but every watch has some major flaw, either not being waterproof enough, or using up batteries too quickly, or lacking ski-related functions. Above all, I want my perfect watch to be able to pass the Robinson Crusoe test: 5 years on a desert island, after first surviving the shipwreck and the swim ashore, surviving water, salt, sand and dust. Most watches aren't waterproof enough, and those that are will become useless when the battery dies after a year or two. My old Avocet Vertech watch (shown above) had all the ski-related functions I needed, it was user friendly and accurate. Unfortunately, it's battery lasted only 2 years, and I had to mail the watch to a service center for battery replacement. The new Avocet Vertech II has a longer-lasting battery, extended to 4 years, thanks to the watch going to sleep when not needed. This is still the most skier-friendly watch. But it is not meant to be worn on your wrist as an everyday watch, it is not very water-proof. It will resist a bit of rain and snow, but don't go swimming with it. Most watches fail in their water resistance. 30 or 50 meters (3 - 5 Atmospheres) will survive some rain, but don’t go swimming with it. 100 meters is OK for swimming, but don’t splash too hard, and don’t dive from a high place. 200 meters is the minimum to be sure that you can take it with you anywhere. We’ll never dive that deep, but when you swim and splash around, the pressure on the watch is a lot higher than if the watch is just sitting at rest at a certain depth. 1. Timepiece (to simply tell time), and Chronograph (stopwatch, count-down timer, and alarm). 2. Altimeter (to tell altitude, number of runs, total vertical skied) and Barometer (air pressure, weather). 3. Compass, to tell us where north is. 4. Tough - to be able to withstand vibrations, bumps, and sudden deceleration (falling to the ground). 5. Waterproof - preferably at least to a depth of 200 meters (600 feet) or 20 Atmospheres. 6. Ski functions - count the number of runs (hills), total daily vertical, the annual total, and vertical speed. 7. Analog hands -which are much easier to see in low light than most digital displays. 8. Digital display - the only way to accurately display altitude, number of runs, and other data. 9. Solar powered, so you don’t have to change batteries every few years, when you least expect it! 10. Affordable - Expect to pay over $100, probably even $200 - $400. But $1,000 is too expensive. Does a complete watch exist, with all 10 out of 10 features? Well, almost! All these features are already available, but not yet in one single watch. Who will be the first to come up with a complete watch? In the meantime, let's rate the existing watches on a scale from 1 - 10, based simply on how many of the above features they have. Beware! Some older watches have altimeters that can tell you the altitude, but do not provide cumulative totals or the number of runs. Some watches, like the Casio Pathfinder PAG80, claim they keep track of cumulative ascent or descent, but what they mean is that you have to start a new "session" by clicking a button every time you begin another ascent or descent. That's a cumulative total suitable for climbers, not skiers. 1. More altimeter watches now include a compass. The generic name for these is "ABC watches", since they have an Altimeter, Barometer, and Compass. By the way, we count altimeter and barometer as one in the scoring below, since they both rely on the same sensor: the air pressure sensor. Every altimeter watch also has a barometer. 2. For years, only Casio watches were solar powered. Now Tissot and a few others offer solar power, but only Tissot and Casio offer solar power in an ABC watch. 3. Analog, mechanical hands are now available in combination with a digital display, in both Casio and Tissot watches. A digital display is needed to show all the numeric data. But analog, mechanical hands are easier to read to tell the time, especially in low light, and especially for the not-so-young whose eyesight isn't as sharp as it used to be. It's easy to tell the time just by the position of the hands, even if they might appear a bit blurry. By contrast, if your eyesight isn't sharp, it might be hard to distinguish between a digital 3, 5 and 8. Some Casio and Suunto watches and the Tissot T-Touch come close to perfection, but each misses some important feature. See the pros and cons below. We rate them here by simply adding up the features from the list of 10 above. Write to the manufacturers and let them know that millions of skiers are just waiting for a watch with all of these features. A GPS watch, computer connectivity. PROs: Lots of functions, including a heart rate monitor. Data can be uploaded to a computer wirelessly. It measures vertical speed based on GPS. CONs: Water resistance only to 50 meters. Battery last a maximum of 14 days, or only 1 or 2 days if GPS is active. Altimeter relies exclusively on GPS, not air pressure. It has functions specific to running, cycling, and swimming, but not skiing. The latest Casio ProTrek, Analog/digital. PROs: Solar powered, as all ProTreks. Has a Compass, Altimeter, Thermometer. Analog hands + digital display. Second hand doubles as a compass when needed. Compass improved over previous models. Solar battery lasts up to 6 months in total darkness, without recharging. CONs: Mediocre water resistance (100m). No skier specific functions. Doesn't count the number of runs. Taking measurements at 2 minute intervals is too slow. Expensive. Lots of features, but not for skiers. PROs: Solar powered, as all ProTreks. Has a Compass, Altimeter, Thermometer. It has the smaller, faster more accurate triple sensor (3rd generation). CONs: Mediocre water resistance (100m). No skier specific functions. Doesn't count the number of runs. Measurement interval of once every 2 minutes is too slow. Loses a point for not having analog hands (which are easier to read), but gains a point for being more affordable than the the PRW6000. The newer PRG280 watch improves water resistance to 200 m, and adds analog hands, but it has no alitmeter at all, and therefore absolutely no ski functions. More affordable than the Ambit. PROs: Has cumulative totals. Has a Compass and Altimeter. You can take it down to a 10 meter depth, good enough for snorkeling. CONs: Water resistant to only 30 meters (the worst of the bunch). Battery lasts only a year. Display is dark, hard to read. The watch band breaks frequently and is expensive to replace. Sturdy, analog/digital, but no ski features. PROs: Shock-resistant, water resistant to 200 meters. Solar powered, recharged by any light source, works for 6 months in total darkness. Has a Compass, Altimeter, and Thermometer. CONs: No ski features in any G-shock models, other than a slow altimeter that measures altitude at only 2 minute intervals. You can do a lot of skiing and then riding a chairlift in 2 minutes. Some of your altitude change will not be recorded. Expensive. This is the watch that made Suunto popular. PROs: Has altimeter (air pressure based), compass, and more. CONs: Water resistant to only 30 meters (the worst of the bunch). People report water leaks in a swimming pool. Battery lasts only a year. The watch band breaks frequently and is expensive to replace. CONs: Mediocre water resistance (100m). Measures altitude for a maximum of 10 hours, and then stops automatically. Takes altitude measurements once every 5 minutes, worse than Casio watches. Tissot has not published information on how long the battery will last without recharging. Sturdy, but no ski features. PROs: Shock-resistant, mud resistant, water resistant to 200 meters. Solar powered, recharged by any light source, works for 6 months in total darkness. CONs: No ski features in any G-shock models, other than a slow altimeter that measures altitude at only 2 minute intervals. You can do a lot of skiing and then riding a chairlift in 2 minutes. Some of your altitude change will not be recorded. Other watch makers should learn about ski functions from this watch. PROs: Good set of ski features. It counts the number of runs as well as the total accumulated vertical. Battery life improved to 4 years (thanks to a sleep mode). CONs: Not waterproof. Only to 10 feet (3 meters). Can only withstand some rain and snow, but not a swimming pool. No compass. Not suitable for everyday use. This is a specialized tool just for skiing. It works best as a second watch. Has to be mailed in for battery replacement. It might be hard to find a new one of these watches to purchase. A specialized watch, but not for skiers. PROs: Has altimeter, compass and thermometer. Accurate weather and altitude measurements. CONs: Probably a bit too geeky to wear as an everyday watch. Uses a lithium-ion battery. This watch is huge: 6 inches x 6 inches. Water resistant to 50 meters. This Timex watch has a completely different definition of "accumulated altitude". According to the manual, if you climb 400 meters and then descend 400 meters, your accumulated altitude is zero! So this watch will not add up your accumulated vertical skied. It just shows you the altitude difference from your starting point. Small, stylish, functional, made in Canada. CONs: Water resistance only 50 meters (5 atmospheres). Battery lasts between 1 year and 18 months. Altimeter measurements are taken only once every 10 minutes (the worst of the bunch). Altimeter records data for only 5 hours (not even a full ski day). Changing the mode from altimeter to compass or to time will stop the altimeter recording, just like on Casio watches. This is terrible! It means that if you want to measure your accumulated vertical, you can't use any of the other functions at the same time. NOTE ABOUT GPS WATCHES: All GPS watches consume so much power that their battery lasts only a day, or sometimes a maximum of 2 days. In most cases, consider yourself lucky if you get one whole day without recharging. The Garmin Fenix is a good GPS watch, if you can live with the short battery life and poor water resistance (50 meters). But keep in mind that it is easy to lose the GPS signal in the mountains, forests, and canyons. NOTE ABOUT SMART WATCHES FROM APPLE, SAMSUNG, etc. Watches such as the i-Watch or the more established Samsung Gear might some day rival the watches listed here, but that day is still far in the future. They can run various apps (if you are satisfied with the tiny screen). But they rapidly consume batteries (lasting maybe 2 - 3 days), and have poor water resistance (3 feet or 1 meter). For now, they are not really in the same category with the outdoors watches listed here. They are the farthest from passing the Robinson Crusoe test. They probably wouldn't even last long enough for a Robinson Crusoe weekend! And almost everything these smart watches can do, your smart phone can do better. NOTE ABOUT CASIO: Casio watches have the highest scores, offering most of the desired functions for a relatively reasonable price. Most Casio watches will pass the Robinson Crusoe test. Casio is the only watch manufacturer offering solar power in most of their watches. Only two other watch makers offer solar power: Seiko (with no altimeter or any other ski functions) and Tissot (which is very expensive). Pro-Trek watches (formerly known as Pathfinder watches) are all water resistant to 100 meters. G-Shock watches are almost all resistant to 200 meters. That makes the G-Shock Gulfmaster one of the best for now. The main fault in Casio watches is that none of them have skier-specific functions. They don't count your number of runs. They do accumulate your total vertical skied, but there is no start/stop button. If you switch from the Altimeter mode to the Compass mode, the watch stops recording altitude. Changing the mode acts as a stop button. That's not good. The altimeter should have a start and a stop button. The watch should continue recording altitude changes and measure cumulative vertical, even if you change modes during the day, continuing to record altitude until you hit the stop button. Also, accumulating vertical currently stops automatically after about 10 hours, which might be just enough for most recreational skiers, but it is not enough for an all-night vertical challenge such as Hope on the Slopes. The altimeter's measurement interval of 2 minutes is too slow. Yes, Casio does offer a shorter 5 second interval, but that only lasts for an hour, and then it reverts to the slower 2-minute pace. If Casio would just tweak it's software to provide skier-specific functions, and shorten the measurements interval to at least 30 seconds, and allow continuous recording of altitude changes regardless of which mode it is in until the stop button is pressed, Casio could easily become the best ski watch in the world. 1. Batteries need to be replaced frequently. 2. Replacement wrist bands for Suunto watches are expensive. 3. Not a single Suunto watch offers analog hands to display time. It's all digital, and screen visibility isn't always good. 4. The alarm on Suunto watches may not be loud enough to wake you. This may have been done on purpose. A weaker alarm means the battery will last longer. 5. Relatively low water resistance; only down to 30 or 50 meters (3 or 5 atmospheres). 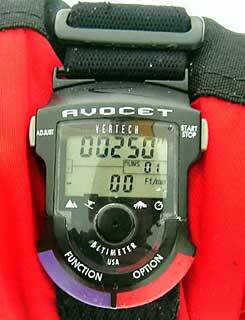 NOTE ABOUT AVOCET VERTECH: This watch has all the skier specific functions we need. If other manufacturers don't know what skier functions we want from a watch, they should take a good look at the Avocet Vertech watch and learn from it. It counts the number of runs (hills), it accumulates your vertical all day, and there is also an additional counter that accumulates vertical all season (or all week, or until you reset it back to zero). It's a pity that nobody seems to be developing and improving this watch. It would be great if the Avocet Vertech could be made to look like a regular watch, make it more waterproof, add a compass, and make it solar powered. NOTE ABOUT HIGHGEAR: Highgear is not making watches any more. Some are probably still available on the market, but there will be no future development, and support is relatively minimal. Highgear Altis has an altimeter, barometer, and compass. But it is water resistant only to 50 meters (5 atmospheres), and it is battery operated (no solar). If you want that perfect ski watch, send your desired list of features to both Suunto and Casio. Ask them to forward your email/letter to those in charge of designing new watches. Compliment Casio on their solar powered watches, but ask them why they are so completely ignoring skiers and snowboarders. There are more skiers and snowboarders in the world than there are mountain climbers. Tell Casio we need the altitude measurements to be taken at least every 30 seconds all day, until the stop button is pressed. Currently, all Casio watches take measurements only once every 2 minutes. In just one minute, you can ski down 500 vertical feet, then get on a chairlift and be taken up a few hundred feet in the next minute, and the watch might not record any of that at all, or just a small fraction of it. Tell Suunto we’d like solar powered watches, because Suunto watches are too battery hungry. Also, Suunto needs to improve the water resistance of their watches. And please add analog hands to tell time. Tell both of them we need at least 200 meters waterproof watch, or 300 meters would be even better. If we are going to buy an expensive watch, we would like it to be truly waterproof. If you write, it is best to send your message to the manufacturer's headquarters, in their home country (Japan, or Finland). Their U.S. offices are mainly for local sales and marketing people, who seem to be unable to forward your feedback letters to those who design the watches. So, it's best to contact the watch designers directly.